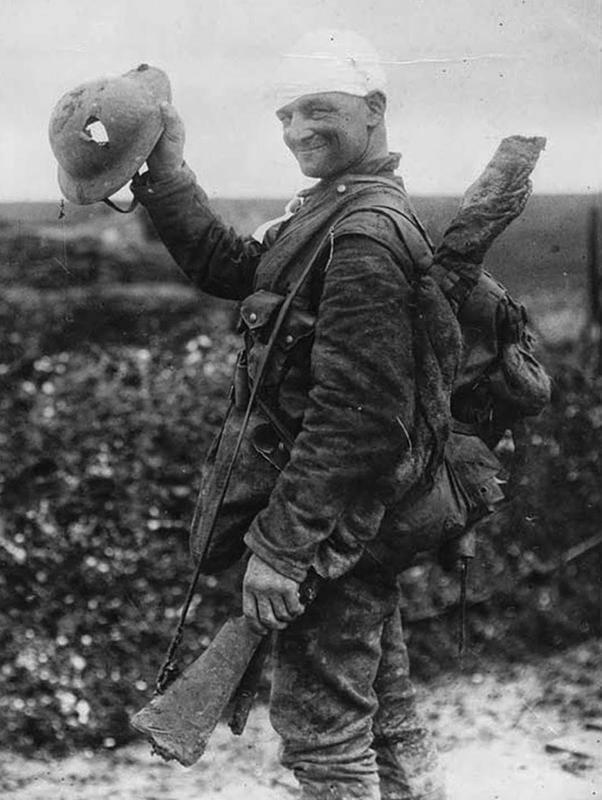 You wouldn't think a soldier who has been shot in the head would have much to smile about, but in 1915 steel helmets had just been introduced. This soldier was feeling very grateful for the protection his British Mk 1 Steel Brodie Helmet offered him - it managed to dissipate enough energy from the bullet that hit him that in spite of the helmet being pierced he only received a minor injury. Original caption reads: “Saved by shrapnel helmet. This soldier, on the way to hospital after being bandaged at Field Dressing Station, shows the helmet which saved his life”. The steel helmets used in World War 1 weren't designed like modern helmets to stop a direct hit from a bullet. In fact, when the war began they weren't issued yet, so soldiers went into combat wearing flimsy cloth hats only. The casualties from artillery in the trenches were very high, and in 1915, 65% of all British injuries were caused by shrapnel from artillery striking soldiers in the head. The french introduced the first steel helmet and the British, designed by John Leopold Brodie, followed soon after.